God's of Eden -  An epic journey of new discovery so fantastic that our natural instinct would be to block it out. Human history is a seemingly endless succession of bloody conflicts and devastating turmoil. Yet, inexplicably, in the light of astonshing intellectual and technological advancement. Man's progress has been halted in one crucial area: he still indulges the primitive beast within and makes war upon his neighbors. As a result of seven years of intense research, William Bramley has unconvered the sinister thread that links humanity's darkest events -- from the wars of the ancient pharaohs to the assissination of JFK. In this remarkable, shocking and absolutely compelling work. 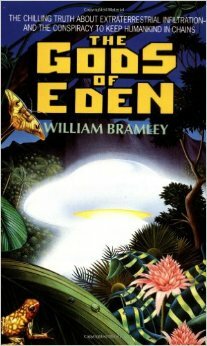 Bramley presents disturbing evidence of an alien presence on Earth -- extraterrestrial visitors who have conspired to dominate Humankind through violence and chaos since the beginning of time...a conspiracy which continues to this very day. William Bramley backs up all of his arguments with reliable sources. Furthermore, his research is not tainted by personal attachment to any particular belief system. He does an excellent job of bringing many neglected and obscured topics to light, some of which will permanently change the way you view the world, its governments, and especially religion. William Bramley is a historian in his own right. His work essentially follows a certain mystery cult throughout history, from ancient times to present day, identifying its branches through their common symbols. He further explains the power that this group holds and its enormous influence throughout history on society and religion. He also theorizes for a short while on the nature of God and human souls. I found this section of the book lacking, as it was based on mere opinion, but still interesting and relevant for the most part. I did, however, enjoy the information on the much neglected topic of paper money and national debt. I was also pleased to find chapters on pharmacological deception, the UFO-cult connection, and the Black Death. "The Gods of Eden" is a very solid primer on alternative human history, which will open up many doors of further research for the inclined reader. It also has the potential of liberating the average intelligent and open minded individual from the relentless clutches of our deceptively common paradigm.